Microsoft has updated its Bing search engine app for iOS with a feature that allows users to search the web using a photo taken on their device. Bing users can now select an existing photo from their gallery or opt to shoot one from within the app, and Bing will use the image to search for similar ones online. User photos can be cropped to get search results specific to an object within the photo, while images that are returned in searches can also be cropped in-app to receive new search results. 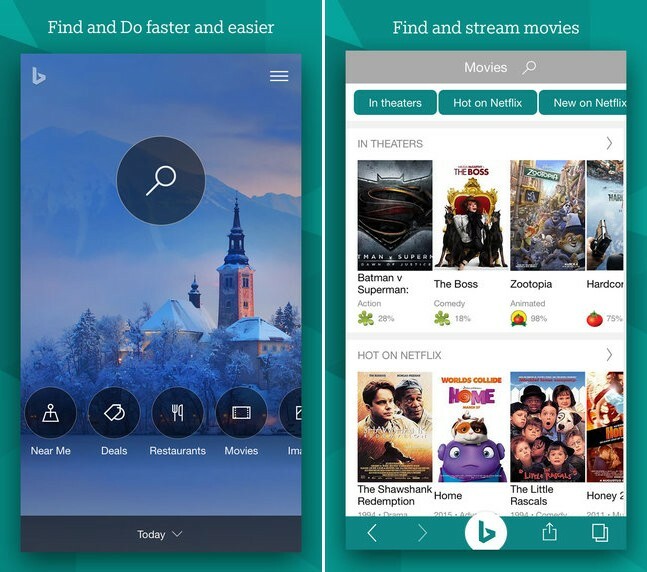 The functionality is similar to Google Goggles which used to be part of Google's Search app before Google removed the feature on iOS devices, so users looking for a replacement might want to give Bing a try. In addition, Microsoft's update enables users to get notified when a movie they're following becomes available for streaming, and also brings search for bus routes and schedules in online maps. Finally somewhere that bing is ahead of google. IMHO. Edit: also snapping his desktop background (even with icons strewn everywhere!) yielded the artist of a painting found on a long forgotten website. Yup... it is called Bing Rewards. You get one credit for every two Bing web searches, among other things. Then you use the credits to choose whatever gift cards you want. This is exactly what I was going to say. It literally pays to use Bing! Did not realise there was a Bing app. This is a cool feature though. Who said innovation is dead? This will be nice for the seven people who use Bing.